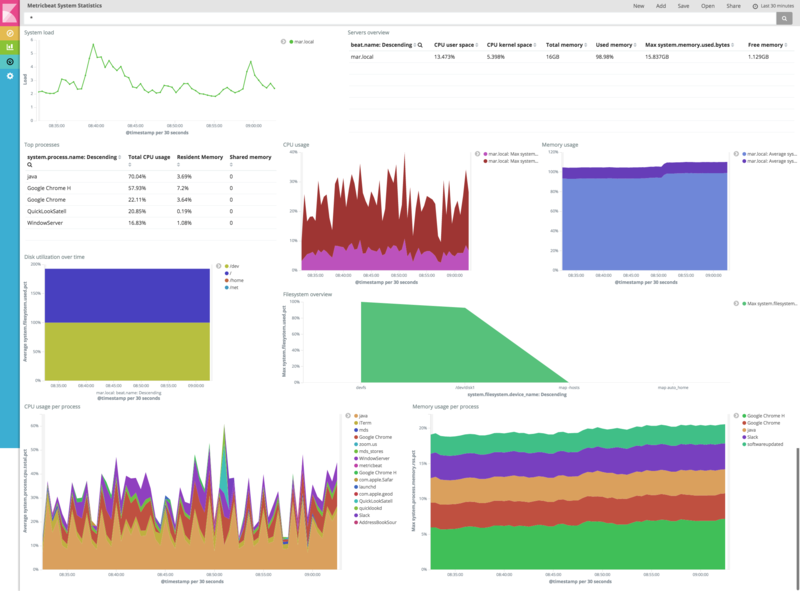 To make it easier for you to start monitoring your servers in Kibana, we have created sample Metricbeat dashboards. The dashboards are provided as examples. We recommend that you customize them to meet your needs. Metricbeat comes packaged with the scripts/import_dashboards script that you can use to import the example dashboards, visualizations, and searches for Metricbeat. The script also creates an index pattern, metricbeat-*, for Metricbeat. The steps in this section show how to import Metricbeat dashboards. You may want to import dashboards for more than one Beat or specify import options that aren’t described here. See Importing Existing Beat Dashboards in the Beats Platform Reference for a full list of command-line options. From the directory where you installed Metricbeat, run the import_dashboards script. On deb and rpm, the scripts folder is located under the home path, which is /usr/share/metricbeat/ unless you change it. Specify the username and password as options. If script execution is disabled on your system, you need to set the execution policy for the current session to allow the script to run. For example: PowerShell.exe -ExecutionPolicy UnRestricted -File scripts\import_dashboards.exe -es http://192.168.33.60:9200. After importing the dashboards, launch the Kibana web interface by pointing your browser to port 5601. For example, http://127.0.0.1:5601. On the Discover page, make sure that the predefined metricbeat-* index pattern is selected to see Metricbeat data. To open the loaded dashboards, go to the Dashboard page and select the dashboard that you want to open.